The opening of the American West is great fodder for writers of historical fiction. Huge vistas, dramatic action, and characters who lived just long enough ago that they don’t feel foreign to us. 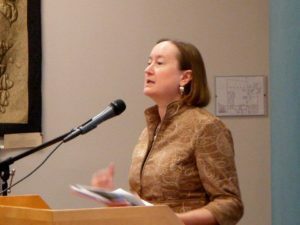 A lot of people writing in that genre draw on their own family stories, and that leads us to Theresa Hupp, and her series about life on the Oregon Trail. 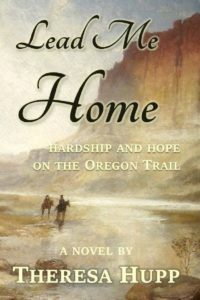 The first book in my Oregon Chronicles series is Lead Me Home. It tells the story of Caleb “Mac” McDougall, a young Bostonian seeking adventure on the Oregon Trail. As he passes through Missouri, he rescues Jenny Calhoun, a lonely girl in trouble. For reasons explained in the novel, Mac and Jenny pose as a married couple. Their journey is perilous and some of their companions untrustworthy. But they both grow in maturity while discovering the beauty and danger of the western frontier. The second novel, Now I’m Found, opens with Mac deciding to return east, because he does not see a future with Jenny. On his way back to Boston, Mac learns of the California gold strike. He joins hordes of prospectors and also participates in the development of California as a state. Meanwhile, Jenny forges a new life in Oregon, but she must deal with the lie she and Mac told their friends in the wagon company. Mac and Jenny separately confront violence, temptation, and heartache in this second book. Do they find happiness? You’ll have to read the novel. 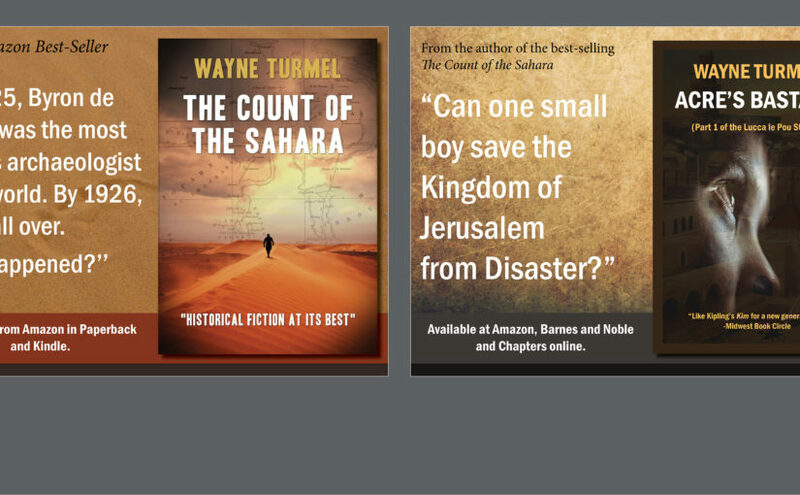 I am currently working on another book in the series. This third book does not deal primarily with Mac and Jenny, but with some of their wagon train companions. I hope to have it published in early 2018. Why that time period? What is it that intrigues you about the Oregon Trail? I grew up near the Whitman Mission in Washington State. Narcissa Whitman, one of the first white woman to cross the Rocky Mountains (in 1836), was my childhood heroine. She and her husband were killed in 1847. Then I found out that one of my ancestors’ family took a covered wagon to Oregon in 1848. These historical and personal antecedents gave me a huge interest in the Oregon Trail, which led me to write Lead Me Home. I set Lead Me Home in 1847 so my characters could meet Narcissa Whitman before her death. 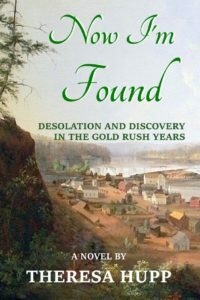 Now I’m Found simply continues the story through the early California Gold Rush years, which really began in 1848 (a year before the Forty-Niners rushed west). Those already in the West had a leg up on finding the easy pickings. Now I’m Found covers not only the early prospectors, but also the development of California as a state and the impact of the California gold discoveries on settlers in Oregon. I know this is a completely unfair question, but what’s your favorite scene? This question really made me pause and think. In general, I prefer writing scenes with lots of dialogue, rather than description. That’s probably the result of spending years as a lawyer taking depositions and listening to testimony. So I like the scenes with lots of tension as the characters argue or don’t tell each other everything. One of my highlights as a writer was writing a scene in Lead Me Home in which a character dies—I made myself cry, so I knew I was writing well. But for obvious reasons, that isn’t my favorite scene. I loved writing the scenes in Lead Me Home that showed Jenny McDougall’s growth from a scared girl to a young woman who could climb mountains. In Now I’m Found, I liked the scenes between Mac McDougall and a character named Consuela. Consuela gave Mac advice he didn’t want to hear. She told him things he should have figured out for himself, but it took him the whole novel to get there on his own. Thanks, Mary Anne. Glad you enjoyed it. Flip through for lots of others. So many great indie writers out there. Thanks for the opportunity to have a guest post, Wayne. Good questions that gave me something to think about. I’ll be following comments to this post for a while, so if your readers have any additional questions, I hope they’ll ask.